Sprayed droplets are mild mist-like and soft to plants and soil. As small droplet water does not harden soil surface, the ventilation in the soil is kept good condition and water penetrates into soil so slowly that water is absorbed by plants effectively, The result is that plants are healthy and water is saved. Uniformed water discharge for long distance with low water pressure and the result is that the germination of seeds are uniform and growing of plants are equal. It can cover broad area along the tube with low water pressure. 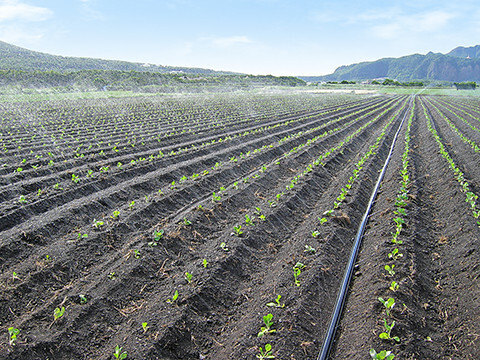 In open field, the area of up to 1,000m² (10m wide x 100m long) is splayed with good uniformity at 2 bar water pressure. The fine water holes are on the tube side printed with the product name "SUMISANSUI R-WIDE", be sure during the tube installation that this side faces up. Vegetables, flowers, turf and lawn in open field. After sowing seeds or after planting seedlings during young stage of plants in open field are very much suitable.